Our travel style covers all the bases. Everything from luxury hotels to budget accommodations, rustic camping to incredible resorts and pampering getaways to adventure vacations. Where-ever we go, we try to get the most out of each visit. If your Ireland travels take place over Halloween, be sure to add Ashford Castle to your itinerary. Book the Wizarding School package for the kids - they'll enjoy loads of fun activities like House Elf baking class, learning spells with a magician, a magical Hogwarts dinner and a movie screening. Meanwhile, mom & dad will have 6 hours of uninterrupted time to enjoy everything Ashford Castle has to offer. Boat rides on Lough Corrib. Falconry expeditions. Romantic walks through the gardens. And a magnificent 5 course, romantic dinner. It's a splurge, for sure. But worth every penny. When you request your family room ask for one that overlooks the Terraced Garden and the Lough. If you can, stay 2 days - one won't be enough! Booked one of the suites and it was great with the family. Having a 'second room' with couch, desk, and kitchenette gave us room to spread out. Wifi was strong and free breakfast was tasty. Just across the street from WOW! Zone entertainment center which has a restaurant, bowling, laser tag and arcade. History of Omaha + Trains! Far more than just Omaha history! If you have a train fanatic, this is the place to come. Explore the Cornhusker Pullman, a lunge car, sleeping car, and caboose. Get up close to a steam locomotive. Learn how hot water made the trains move. Fascinating! Lots of other permanent and temporary exhibits - very interesting and some hands on. When you enter Union Station the upper level looks like the train depot it used to be. Make your way to the statues- they have stories to tell. Plan 2-3 hours here. Finish with a shake or malt from the historic soda fountain. They still make their shakes like they did in the 1940s. If you're going to explore Omaha the Old Market is a terrific central location. Many attractions are within walking distance, and those that aren't are easy to reach by hotel shuttle. Eat: The Twisted Fork- great American food with a twist. Portions are large. Be sure to try the Chicken Fried Bacon. Eat: Ted & Wally's Ice Cream - made fresh daily with fresh ingredients. Amazing flavors that change daily. Eat: Cupcake - I'll just say yum. Explore: Hollywood Candy - so much more than a candy store! You'll find an old-time soda fountain, arcade, more candy than you knew existed, and a theater (free). Explore: Gene Leahy Mall - at the north end of the Old Market. Man made lake with walking path. Artsy benches and a terrific pair of slides at one end. Shop: plenty of specialty shops to browse. Hyatt Place is a great hotel for the family (see review) When the Old Market gets busy on weekends take the kids to Hollywood Candy. Get some popcorn and settle in for a movie. They were showing Back to the Future when we visited. The Omaha Visitors Center is in the Old Market. Make that your first stop for information adn money saving coupons! Definitely worth a visit if you're in Omaha. These are the locomotives that welcome travelers on I-80... and they are HUGE up close! Free to visit and the small park has some Omaha railroad history. Quite a few steps to climb from the Lauritzen Gardens parking lot- but totally worth it! I'm always up for a garden walk, but my girls can be less than enthusiastic, so I wasn't sure how they would like Lauritzen Gardens. I needn't have worried. The gardens here are beautifully done, with pathways to explore, plenty of interesting things to see, and two gardens specifically for the younger set. Everyone in our family was entranced my the Model Train Garden. Half a dozen model trains wove through tunnels of stone and across bridges of sticks. The buildings were also built of natural materials and were absolutely amazing. The Children's Garden has a Sunflower Forest, a Rainbow Garden, and hands-on activities in the 'see, touch, taste & smell' areas. The Garden in the Glen leads to the Bird Sanctuary, which is great to explore. If you visit in the morning and stay longer than you planned, the cafe is really quite nice and the food is fresh. Sandwiches are huge (and completely share-able) and with the specials you'll end up with more food than you planned on - so order wisely. No food or outside drinks allowed. Kenefick Park is adjacent (see reviews), free, and very much worth visiting. This has been an incredible zoo since I was a kid- and it continues to be so! So very much to see and do- we spent 5 1/2 hours here and didn't see it all! Desert dome is fabulous - and don't miss the exhibition below of creatures of the dark (bats, naked moles, etc). Terrific monkey/ ape enclosures, large cats exhibit, sea lions, one of the best aquariums in the country, giraffes, bears, penguins, petting zoo... I could go on and on. The animals here are so active, their enclosures are open (sometimes the people are the ones in a 'cage' so the animals can be more free to roam). Plan to spend an entire day when you visit. Stingray bay and IMAX theater are additional fee. Food here is expensive but you are allowed to bring you own in! Skyfari (sky gliders) and train rides available. Skyfari is superior and the best way to view the giraffes. Wonderful location with a great staff. We took Megabus to Omaha and planned our exploring based on hotel shuttle and walking. We were able to see the top attractions in Omaha easily with the help of the very friendly shuttle staff. The two queen room was so spacious - it even had a cozy corner couch that really helped us spread out comfortably. The pool isn't huge, but the girls loved it. And the free breakfast was really good! Fresh made breakfast sandwiches, a fruit and yogurt bar, French Toast and plenty of breads and pastries prepared us for days of exploring. Our room was next to the elevators, but we didn't hear them at all. We camped at Wylie Park Campground for 3 nights. 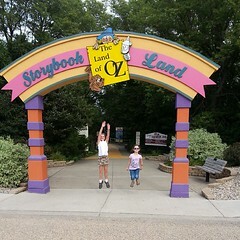 Our site was right beside a small playground and within walking distance of the entrance to Storybook Land. Camping facilities have spaces for RVs and tents and even offer cabins. A great place to camp with the family! Wylie Park is large and has plenty to keep the kids busy. Mini Golf, Go Karts, a beach and paddle boats, playgrounds and the FREE Storybook Land. If your kids hear Mother Goose Nursery Rhymes as they grew up, they will love stepping into those very stories at Storybook Land. A free park (only 3 attractions have a fee, and then under $2) filled with characters your kids know - and now they can be part of the story! 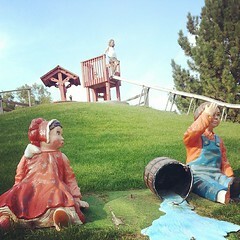 Tumble down Jack & Jill's hill.... Climb the clock in Hickory Dickory Dock... Feed the animals at Old MacDonald's Farm. 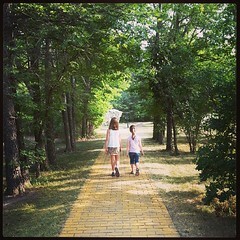 Also here is The Land of Oz where you can walk through the Wizard of Oz along the Yellow Brick Road. My girls were 6 & 8 when we visited and really loved the park- we went 3 days in a row! They didn't tire of remembering the nursery rhymes and making their own stories as they played. A big, modern playground is directly behind the park's visitor center where you can buy tickets for the few rides that need them, as well as grab a snack and souvenirs. Jody Halsted hasn't written any reviews yet.